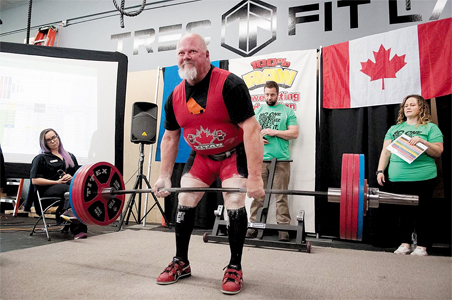 Randy Sparks’ return to the powerlifting arena was a successful one as he competed at the 100 Per Cent Raw Powerlifting Provincial Championships in Calgary. Sparks ended up in first in the 110-kilogram division for 60-to-64 year olds. Sparks registered a squat of 462 pounds and a deadlift of 518 pounds. Both were Canadian and world records. There were 150 competitors at the event, 70 of which were women. “In the past year there has been a huge increase in the number of women that are competing in powerlifting, which is very nice to see,” said Sparks. Sparks will be competing in the Canadian Championships on Aug. 18-19 in Medicine Hat. Plans are in the works for a powerlifting competition in September.